Karelia is well-known for natural and tasty ice-cream, milk products, jams made of local berries, smoked and salted fish. 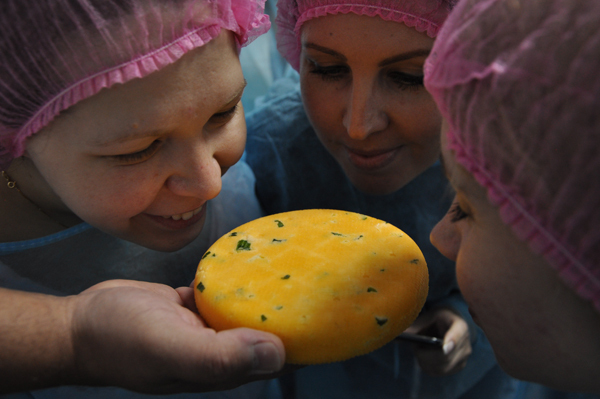 Recently the first cheese factory has been opened in Karelia 70 km away from Petrozavodsk. Our team were honoured to be one of the first guests of the cheese factory. At first we were shown the factory and met all the staff. The factory is not big with only 6 people working to produce 100% natural cheeses. At the moment they produce 4 cheeses: two beloved Italian cheeses ricotta and stracchino, and two cheeses with Karelian names: Ladva and Girvas. Ladva Cheese is soft and has a fine flavor. It was named after the settlement Ladva, where the factory is situated. Girvas Cheese is hard. It was named after the Karelian extinct volcano Girvas. Girvas is ivory in color and has rich cheesy flavor. The cheese rind is edible. It is covered with chocolate and pepper. After the excursion around the factory we tasted all the varieties and tried to make our own mozzarella. That was a lot of fun! If you also want to taste Karelian cheeses and see, where and how they are made, we invite you to join our 1-day tour to the cheese factory in Karelia.